Dr. Christopher D. Abrasley, M.D. is board certified by the American Board of Internal Medicine with a sub-specialty certification in Gastroenterology. Before relocating to the Emerald Coast, Dr. Abrasley received his medical doctor degree from the University of South Alabama School of Medicine in Mobile, AL. He then went on to complete his residency at Orlando Regional Medical Center in Orlando, FL, in Internal Medicine and his fellowship training at the University of Mississippi Medical Center in Jackson, MS, in Gastroenterology. Dr. Abrasley specializes in colonoscopies, upper endoscopy (EGD), flexible sigmoidoscopy and percutaneous endoscopic gastrostomy (PEG) tubes at White-Wilson Medical Center in Fort Walton Beach. He values the relationships he has formed with his patients, and believes that it is important to listen to his patients and partner with them on decisions impacting their care. 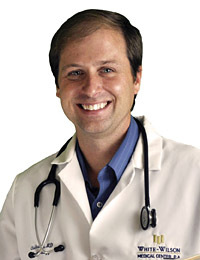 Dr. Abrasley resides in Fort Walton Beach, and enjoys the beautiful lifestyle on the Emerald Coast with his wife.